Item # 4/0-3FHDFG, Flat Jacketed Heavy Duty Type THW Submersible Pump Cable On Crown Wire and Cable Co., Inc. Conductor Class B , soft drawn, bare copper per ASTM B3 and ASTM B8. Insulation Heat and moisture resistant, polyvinyl chloride meeting the requirements of UL 83 for Type THHN and THWN wires. The insulation is acceptable for use in locations at 90°C dry or 75°C wet. The insulation thickness is in accordance with Table 25.1 of UL 83. 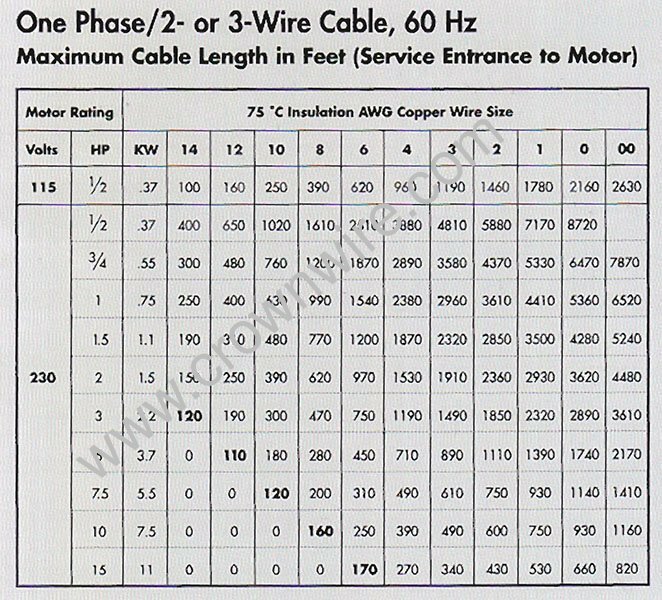 Ground Conductor Class C (19 strand), soft drawn, bare copper per ASTM B3 and ASTM B8. The conductor is insulated with PVC/'Nylon and the nominal overall diameter shall equal the insulated circuit conductors. Assembly The insulated circuit and grounding conductors are laid flat and parallel together. The jacket will be applied directly over the insulated conductors encapsulating them. Jacket Heat and moisture resistant black polyvinyl chloride meeting the requirements of UL 83. The thickness is in accordance with Table 25.5 of UL 83.